The legalization of cannabis in a number of U.S. states has led to a greater discussion about the potential benefits of the substance and the laws surrounding its consumption. 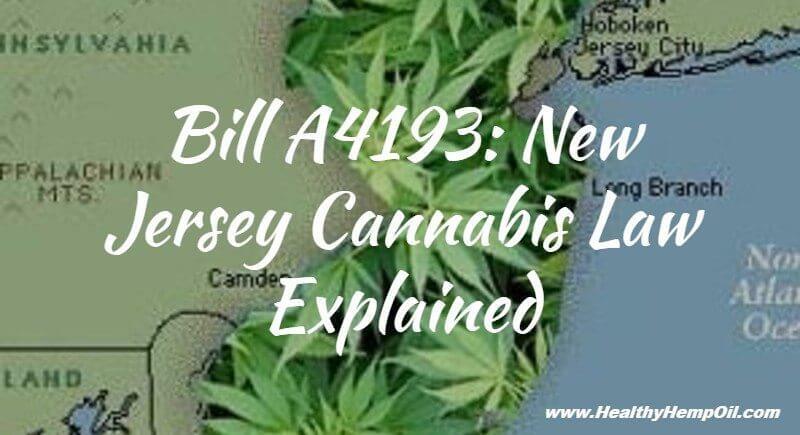 New Jersey Cannabis laws are some of the many under review with the introduction of A4193, sponsored by Assemblyman Michael Patrick Carroll. Proponents of legalized marijuana in the state have cited the success of the drug’s legalization in states like Colorado. Should the bill pass, New Jersey would join Colorado and others such as Oregon, Washington, and Alaska in recreational marijuana. Let’s dig deeper into the issue of New Jersey Cannabis by taking a closer look at A4193. What Does A4193 Mean for New Jersey Cannabis? While New Jersey currently allows for the purchase of medical cannabis, there is still much to be done in order to legalize recreational cannabis throughout the state. Bill A4193 calls for two things: Should it pass, convenience stores would be allowed to sell cannabis as they would cigarettes, making it available to people 19 and older. The bill is co-sponsored by Michael Patrick Carroll, a right-wing lawmaker who is considered by many to be the “most conservative” policy maker in the state. His push of the bill speaks volumes of the evolving mindset regarding legalized cannabis. The push for legalization is a long time coming. In recent years, the DEA has come under fire for refusing to reclassify cannabis as less than the dangerous substance it is currently considered in the eyes of the law. According to the DEA, cannabis is in the same group of drugs as cocaine or heroin. This claim has been rejected by science as cannabis has been recognized for its various medical benefits. Legalizing cannabis in states like New Jersey and others will help draw attention to this unfair scheduling of the drug, which both hinders funding for research and results in many unjust prison sentences for nonviolent offenders. With a growing amount of people turning to cannabis to provide relief for their ailments, government funding would enable further study into the drug’s benefits. How Does A4193 Affect Past Cannabis Convictions? Aside from legalizing cannabis for personal use, the bill also seeks to provide relief for those convicted of nonviolent offenses related to the drug. While the bill has certainly gained support from both Democratic and Republican lawmakers alike, if it does pass, it is still subject to veto by the state’s governor, Chris Christie, who is almost certain to put a stop to legalization. The governor has long been an opponent of legalized cannabis, going so far as to pledge to eliminate legalized cannabis nationwide if he were elected president. If this does happen, however, Carroll and other supporter of the bill remain optimistic that this is simply a starting point. A major source of controversy involving the bill entails expunging past marijuana-related crimes. If it passes, cannabis would no longer be punishable by the New Jersey Code of Criminal Justice and would no longer be considered a controlled dangerous substance by New Jersey’s Controlled Dangerous Substances Act. According to the bill, cannabis users holding prior convictions for possession or use, have been convicted of being under the influence of marijuana, or demonstrated “failure to make lawful disposition of marijuana” would then qualify to have their convictions expunged by “expedited process” via the Superior Court. This isn’t the first piece of legislation calling for New Jersey cannabis to be legalized. Last November, Sen. Nicholas Scutari introduced the first legalization bill in the state. A chairman of the Judiciary Committee, Scutari’s bill called for cannabis legalization for citizens 21 and over, where the substance would be taxed with revenue used for public purposes such as education. Further demonstrating his commitment to legalizing cannabis in the state, Scutari has invited fellow lawmakers to accompany him on a trip to Denver, Colorado, this month, where they’ll see the state’s work in legalization in action. A similar bill, introduced by Assemblyman Reed Gusciora, would allow residents of the state to grow up to three mature cannabis plants at their home, allowing for sales of up to 1 ounce of cannabis. The bill also called for legalization of cannabis in Atlantic City, an attempt at helping the city’s struggling economy. Given the vast potential for revenue, the voters of New Jersey would do well to seriously consider what the bill could mean for business. What Is Prohibited Under the Bill? While the bill seeks to loosen laws involving cannabis, there are still provisions that prohibit certain activities. The bill would liken legal marijuana to cigarettes, prohibiting smoking in a variety of indoor locations or public places, as dictated by the New Jersey Smoke-Free Air Act. Additionally, if passed, the bill would prohibit the industrial manufacturing of cannabis for employers in home settings as well as advertisements for cannabis on school buses leased by a school district. There will also be school programs dedicated to informing students about the physiological, sociological and psychological effects of recreational marijuana. This isn’t the first time Carroll has been vocal about a divisive issue. He has referred to the War on Drugs as a failure on more than one occasion. The lawmaker was also co-sponsor of a bill that ultimately became New Jersey’s medical marijuana law. His outspokenness has proven effective in stirring conversation about the nation’s current drug laws and how they can be improved. Even Gov. Chris Christie supports medical marijuana in the state, though he is not in favor of expanding it. With Colorado’s growing success in the cannabis industry, more states have begun to contemplate their current cannabis laws. This has led to a greater discussion about the wide range of benefits associated with cannabis. If New Jersey’s cannabis legalization bill comes to pass, the state may experience an increase in tourism, as has Colorado and other states who have legalized the substance. With the economic benefits of legalized cannabis widely recognized, the bill may be just what the state of New Jersey needs to revitalize Atlantic City. This entry was posted in United States CBD Policy and tagged New Jersey.